DAX has three periods to date functions which easily allow the creation of common the common measures (Month To Date, Quarter To Date and Year To Day). This post looks at period to date calculations and member sorting in the BISM tabular model. By default the tabular model sorts members by name. 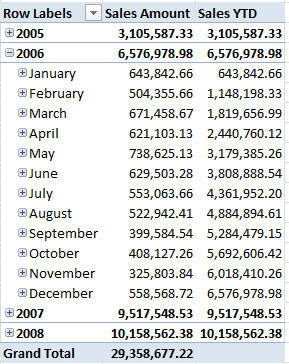 For example, clicking on the month field shows the alphabetical listing of months. Although these values are shown in the project model they are displayed in the same order when the project is deployed.The order of these members can be changed and sorted by an additional column by using the sort by column function (menu path: Column > Sort > Sort By Column).When this is done, we simply specify the sort column in the popup (below). After sorting, members appear as expected in both the project design and deployed project. Period to date can be easily created using the DAX functions TOTALYTD, TOTALMTD, TOTALQTD. Note that these functions are not dependent on sort order but on a related date field. For example, a date field in the related DimTime table.Note that there is a primary relationship between FactResellerSales and DimTime and the inclusion of the TimeDate (which is a date data type) column in DimTime. Also note that measures (as they would be thought of in SSAS) must be added to the ‘Measure Grid’. If they are not, measures are not seen in the cube. The table FactResellerSales has columns hidden from client tools (so that no dimension members are created) and contains the measures [Sales] and [Sales YTD] (below). Browsing the cube shows data (sorted) with YTD values as expected. Unlike SSAS, the tabular model will show the [YTD] measure defaulting to the last year when the (related) time table is not used. The technet reference for these functions can be found at YTD , QTD , MTD . As a consultant who specialises in SSAS, I didn’t think that the semantic model could stand up to the UDM dimensional structure. After all, SSAS has hierarchies, sorting and the ability to assign attributes, values and names. None of these options were present in the release of power pivot and I expected the semantic model to be enterprise power-pivot. How wrong I was! Hierarchies are very easy to implement in denali. In this example, a dimension (if I can use that word) is created for adventure works product groups. As a refresher, the ProductSubCategories are related to ProductCategories which allow the RELATED function to return the product Category name to be shown in the ProductSubCategory table. A hierarchy can then be created by selecting the table we want a hierarchy for and selecting ‘Create Hierarchy’ from the popup menu (right click on the DimProductSubcategory table). If no fields were selected when the hierarchy was created, the hierarchy is created with no levels. Levels can be added now by dragging attributes into the hierarchy. If fields were selected when the hierarchy was created, they will be included in the hierarchy and can be rearranged by dragging then to a different level. Finally, the names for all objects (tables, attributes and hierarchies) can be changes by using the Rename option from the popup. (Right clik àrename). The the dimension (again, should I be using that word ?) is finished, it looks as excpected in both the designer (below) and browsing the model in SSMS (right). Perhaps, I’ve been using SSAS for too long but I find this functionality is very intuitive and easy to use. What can I say but well done! This post looks at extending the time series prediction so that multiple values can be predicted. In the last post (DMX 101) only a single value was predicted and while this can be useful, the approach has obvious draw backs because there is often an expectation that different classes have different patterns. Consider seasonal fashion. We expect that seasonal products will have a distinct life-cycle and to group products (from multiple seasons) would distort a specific seasons sales. There are two ways of dealing with multiple predictors. Firstly, we can treat each as a function value of the same sequence. In this method, we identify a value for y1 and a corresponding value for y2. In this approach, the series key is simply the x (time) value. The second method considers that only one value is being predicted (y) which is a value derived from the series key and an additional identifier which specifies the function (as either y1 or y2). In this situation, our predicting data is represented as functions of (the time) series key (see right). This is represented by the SQL below. The model is created and trained with the following commands. The second approach incorporates the function (or class type) into the model key. We can see that the data for the model shows a y_value that is dependent on both the x and y_function columns. Additionally, it is important to note that training Time Series model requires ordered data. or, by specifying the class that will be predicted. The addition of class tags into time series models improves their useability by disseminating an aggregate sequence into components. This post has looked at the two methods for including class tags and the prediction implicatios of each.